Alex and Marion tied the knot on a gorgeous June day at French’s Point in Stockton Springs. 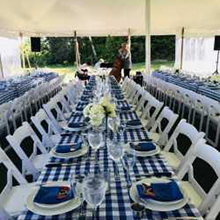 The couple, their friends and family enjoyed a lobster bake followed by fireworks on Friday night and a ceremony and reception overlooking the water on Saturday. The rehearsal dinner highlighted all things Maine: lobster, nautical style, and a night down at the beach. The ceremony on Saturday took place on a point overlooking the ocean and was followed by a tented dinner and party! Congratulations to Alex and Marion! Rehearsal Dinner Catering: Bar Harbor Catering Co.